The Venue: John and I both grew up going to the North and South Carolina coast with our families. I always wanted to get married outside and on the water. The beach and inlet was a large part of my childhood and is a special place still today for both me and John. DeBordieu was the perfect venue for both our ceremony, reception and our entire wedding week! The Colony is spectacular and a very romantic place to have a wedding celebration and is so picturesque! 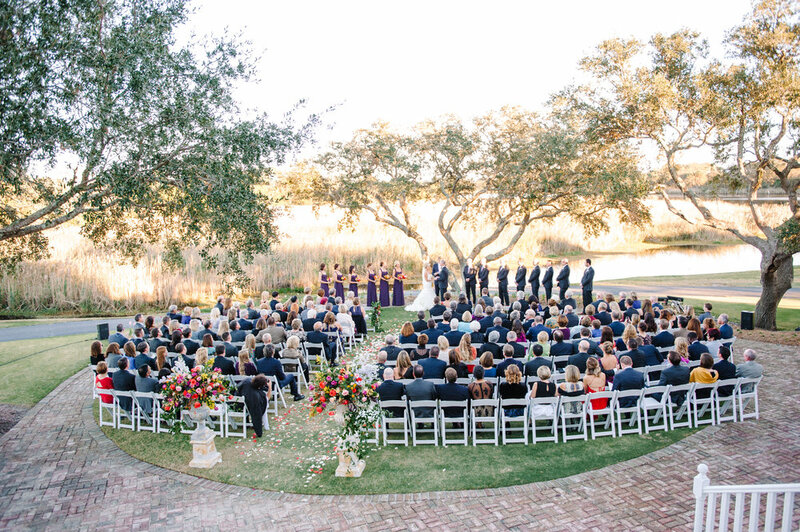 We got to use the entire grounds to celebrate our special day… the Spanish moss trees, golf course and marsh inlet was the perfect backdrop! Most of our family, friends and guests rented houses, villas and condos on DeBordieu, so it was cool having most of the Island to ourselves! We had festivities going on from Thursday – Sunday. Thursday night, my in-laws hosted the wedding party, close friends and family to their home for cocktails and appetizers and then we all went to Frank’s Out Back Restaurant & Bar. Friday there was a Bridemaids Brunch at the Rustic Table in Pawley’s Island and the guys golfed at DeBordieu. The rehearsal dinner was at the DeBordieu Beach Club followed by a Welcome Party on the Blue Herron Deck with a band! On Sunday there was an after wedding brunch at the Pavilion for all guests with a Bloody Mary and Mimosa Bar! The common theme of the whole week was happy love! Sharing this fabulous time with closest family members was incredibly special. Finding the dress: My wedding gown was from the designer boutique, Winnie Couture in Charlotte, NC. The store is located in the heart of Myers Park and on one of my favorite streets in the Queen City. When I walked in, I was just in awe. The beauty, décor, chandeliers, aromas, dresses, etc. were over the top!! I went by myself the first time with my Mom there in spirit. I tried on like 10 dresses and the third one was it, I just knew it! It was so me, I felt like a princess and was able to custom design the beading, lace and color. This was my dream wedding gown!! It was fun discussing ideas with the staff while drinking champagne. I did my due diligence and went to a few others boutiques with some of my bridesmaids/girlfriends, but didn’t like what I saw and immediately went back to Winnie and ordered the most perfect, stunning dress for ME. The excitement, anticipation and pre-wedding moments having our family and wedding party together was wonderful! The ceremony began with prelude music played by a harpist to set the tone of the ceremony. Once the ceremony officially began, she played “Ave Maria” for the Grandmother and Mother’s seating, “Jesus, Joy of Man’s Desiring” for the Wedding Party, and “Canon In D” for the Wedding Processional. For years, I have wanted to walk down the aisle to that song on the strings. The music selection was specific and detailed to our personalities – dance music. To honor my late Mother my bouquet was bound in an heirloom white handkerchief that my Grandmother wore on her wedding day and was finished with a slim teal ribbon and an ovarian cancer pennent pinned on it, her hand tied bouquet was placed by my brother on the first chair in loving memory of my sweet Mom. The flowers at the entrance to the ceremony were placed in loving memory of my late grandfathers and grandmother and John’s late grandparents. 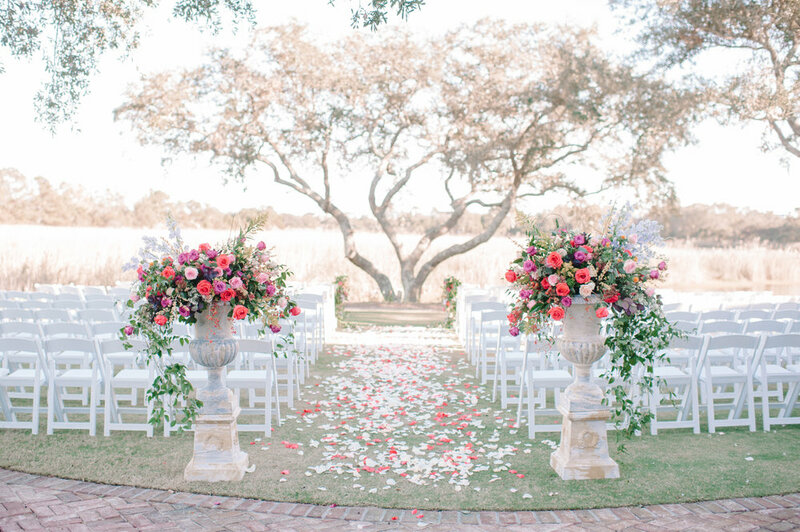 Fragrant rose petals were scattered down the aisle. During the ceremony, our minister added special, personal touches about our love, relationship, the meaning of family and my Mom. John and I said our traditional vows and the looks we gave each other were so happy and joyful. Everyone could feel our love! Hair & Makeup: I wanted my blonde hair to be up and to the side with a loose bun having my natural curls flowing and bouncing around. We added some clip on extensions to add volume to the updo. I wanted my makeup to be very natural with light tones to compliment my skin, blue eyes and blonde hair. I looked flawless in the pictures and felt like a baby doll!! 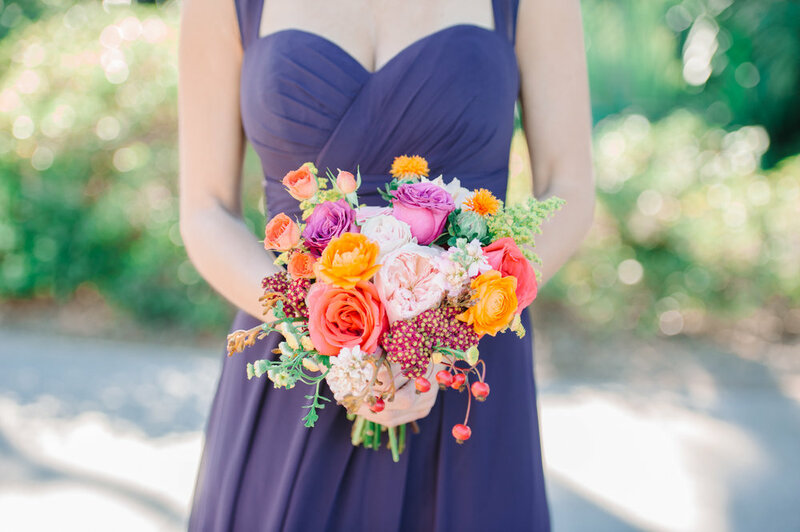 Aesthetic + color palette: Almost everything associated with my aesthetic and color palette came from a picture of a bouquet that I absolutely loved…it had my favorite colors of creams, golds, pale yellow, orange, peach, green and copper which complimented our theme color of plum. I wanted everything to have a vintage flare, be eclectic, fun & whimsical…colorful with gold accents. The textural design of the flowers echoed the palette and bouquets and the focal tree created a fun and enchanted feel for our quests. I like to think that the style of our wedding and reception also reflected the style of our daily lives. I wanted it to be a reflection of us…who were are and what we love. I am so pleased with how we pulled that off! Bridesmaids Attire: The girls wore an eggplant plum sweetheart Bill Levkoff chiffon dress. Men's Attire: The groomsmen, groom, and fathers of bride and groom wore charcoal gray suits by Kenneth Cole. The ties complimented the bridesmaids dress color and John bought a handsome Italian Kiton tie to wear for our big day! 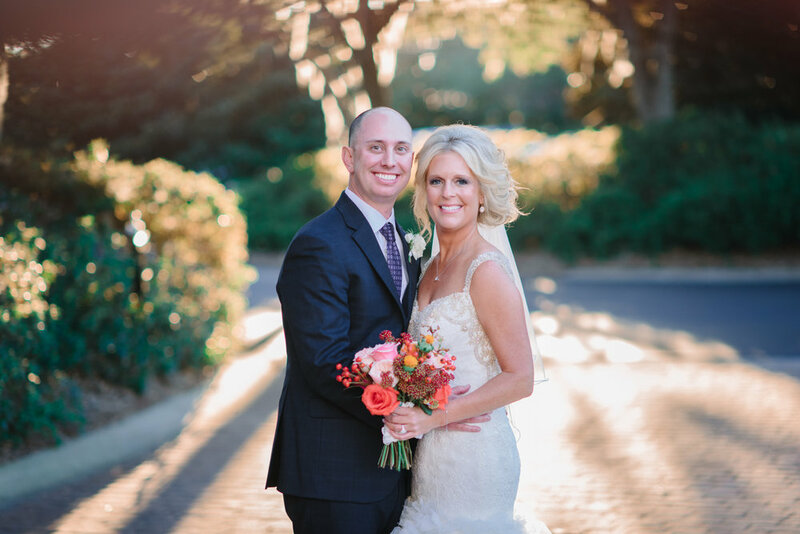 We both love the fall season and didn’t want a prolonged engagement…The timing was perfect, and you can definitely plan a wedding in five-six months!! It also helped that his Mom and I were doing some pre-planning, meeting/interviewing with several vendors and penciling in dates :) Memorial Day weekend we were with John’s parents, spent one full day in Litchfield, Pawley’s Island and DeBordieu. At that time, I was ready to book and hoped we would get engaged soon so we could have a fall wedding! Our day was full of special touches and tributes honoring my Mom who is in heaven and to our wedding planner, Della Ramsey who is a good friend now! She and I connected so well and when I described what I dreamed of and wanted, she had the greatest ideas!! It was such fun working with her and she went above and beyond my expectations! Della paid close attention to details and all of our events were FUN, FUN and FUN!! Some of these special touches include: Our “J & J” theme…an assortment of decorative napkins, koozies with the state of NC printed on one side with a WF logo and Chapel Hill Tar Heel footprint and the other side said #phelpartyoftwo, cups, candles, pillows…. The decor: Wooden toppers in a fumed gray stain dressed our round tables as well as copper table toppers with touches of gold in varying items such as lanterns, votives and lights helped bring everything together. Another big component for me was that our guests had places where they could gather around and visit with each other. We accomplished this by setting up lounge areas with hand-stained custom indoor-outdoor furniture sets including sofas, chairs, coffee tables and a saddlestitch rug. We added decorative pillows. I loved seeing people enjoying this aspect of the reception and I believe it made them linger longer especially the non-dancers. These areas were set up near our custom off-white cake stand with a greenery band to cover the single layer of Styrofoam that fit under the bottom layer of the cake. Cake: John was eager to help me pick out the cake (ha) and we had fun doing the tasting and creating our own wedding cake. We designed a 4 tier layered cake with different flavors on each tier. The cake design theme was an “exploding roses” down the layers with copper edges on the cream frosting. The flavors were carrot cake, almond, and pumpkin spice. At our cake cutting, we toasted with Waterford engraved crystal champagne glasses bought in Germany from my Godparents. The Invitation + Paper Details: I wanted my wedding invitations to be very unique and one of a kind. With the help of Della and Traci custom calligraphy invitations were designed and printed by Kleinfeld Papers through the RSVP Shoppe in signature eggplant ink and hand addressed in the matching ink. They were breathtaking and received so many compliments. When the reception finally began, we started things off with mine and John’s first dance. We danced to “The One” by Kodaline My Dad and I danced to “Daddy’s Little Girl” by Tim McGraw and John and his Mother dance to “How Sweet It Is” by James Taylor. I was on the Wake Forest Cheer/Dance team and it has been a tradition to play the fight song at our receptions. All of the girls, our coach and other Deacon fans got on the dance floor and cheered. I also wanted to have the band play the North Carolina Tar Heel fight song for my husband and his fraternity took their ritual picture. It was so awesome that our friends blended so well together and had such enthusiasm the whole time! I wanted the dance floor to be packed all night and this definitely helped set the tone! The whole night went by too quickly but it was so much fun and an absolute blast!! Too many dreams came through on that day to count! Instead of a traditional guest book, we enlarged a hand painted map of DeBordieu with all of our wedding festitivies and places on it with a boarder for all guests to express their wishes. Our guests wrote us notes and we have now glassed the frame and hung it in our home! One of my favorite things was the four-sided bar featuring mirrored fronts with an organic oyster trim designed by Blossom Events, the beautiful garden-inspired centerpieces filled with fresh blooms and lush greenery, a series of frosted, patina and copper votives, the gold and glass bar and tree lanterns, “fairy lights” were hung in the trees and the gradient shades of autumnal shades crowned with a greenery cornice at its top with the arched design featuring flowers along the perimeter…it was so elegant! The Favors: When our guests checked into their rooms, they received a “J & J” bag filled with lots of goodies. We provided sweet and salty snacks, Smackers from Pawleys Island, DeBordieu bottled waters, monogramed koozies and candle and a hand painted map of the Island where all of our festivities took place and a note from us. At the reception each guest took home a gold/cream painted seashell with “J & J” 11.05.16 hand written in an eggplant color. What was your first dance song? “The One” by Kodaline…the words fit our courtship/relationship perfectly. The Send-off/Getaway Vehicle: As it was time to leave, we said our good-byes, hugged our parents and got in our Vintage Packer that was stocked with alcohol and food! The car was decorated with beautiful flower arrangements and a “just married” sign on the back :) We rode around for a little while as John had reserved the “Villa de Amore” oceanfront condo for our wedding night!! Best Piece of Advice for Brides-to-be: With the planning, don’t get too caught up with tradition or trend, think about you and your fiancé and have fun creating a day that is truly representative of who you are! Also, once the day finally arrives, just let go and have the most fun! And remember, the best is yet to come…the wedding day is only day 1. John was so involved with our planning…it was so amazing to see him so excited! Is there anything else our readers would love to know about your wedding day? The weather was spectacular for early November! No rain, temps in the low 70 degrees, the wind calmed down just before the ceremony and the sun was shining!! What are you plans and goals as a newly married couple? To love and cherish each other every single day, laugh, have fun, make new memories, start new traditions…. Enjoy our hobbies such as golf, snow skiing, barre class and yoga, going to Panthers, Wake Forest, North Carolina Tar Heels games! We love our church and can’t wait to purchase a new home. Continue to learn how to love each other well and how to go through life together as best friends. Travel, spend time with family, friends and one day have a family!